The NYPD launched a new citywide crackdown on private garbage trucks last night in a move made after mounting pressure to regulate an industry riddled with safety issues. 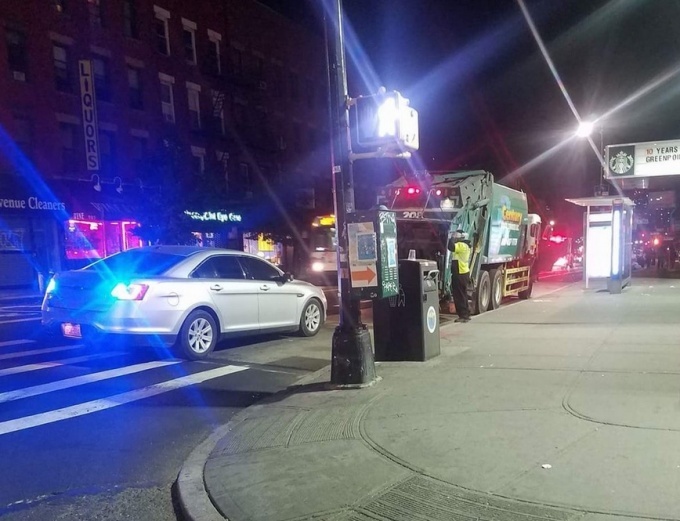 For this week, the NYPD and Business Integrity Commission are deploying at least one car in every precinct during overnight hours as part of the crackdown to ensure private trash trucks are operating on city streets lawfully. Units specializing in truck inspections, meanwhile, will also be deployed citywide to inspect private trash trucks. Police officers, additionally, will be instructed to issue summonses to private carting trucks seen violating traffic and equipment laws. The city says the initiative comes after a series of NYPD spot inspections in the past month, where police found that every garbage truck stopped in a Midtown Manhattan and Bath Beach precinct had multiple infractions including faulty brakes, leaking fuel lines and no lights. It also follows ever-growing pressure to regulate an industry that has come under fire as of late for issues like reckless driving that has resulted in injury and death. In 2017 alone, private sanitation trucks killed seven people. “The results from just one night’s enforcement activity, which found an alarmingly low rate of legal compliance among these trucks, are a sobering reminder of how much work we still have to bring down traffic fatalities—and truly make our streets safer for all users,” said DOT Commissioner Polly Trottenberg, which said the agency is aligning itself with the crackdown as part of its Vision Zero initiative. One of the seven that died last year was 27-year-old Neftaly Ramirez, who was killed in a July hit-and-run after being struck by a Action Carting truck on Franklin Street in Greenpoint, where truck traffic enforcement is an ongoing issue. The driver, however, was never pressed with charges. A ProPublica report released earlier this year investigated the “deadly” waste removal industry, and highlighted Sanitation Salvage, a Bronx-based company that was involved in two fatal accidents and many collisions. The report and subsequent hearings led to the city suspending the license of Sanitation Salvage over the summer. The company, however, regained its license just one month later in September after agreeing to operate under an independent monitor. While the crackdown went into effect just last night, one incident was already reported involving a private trash truck striking a 43-year-old cyclist just after 9:30 p.m. on Monday. The victim was rushed to an area hospital in serious but stable condition.